Organic sunscreen refers to all natural ingredient sunscreens. 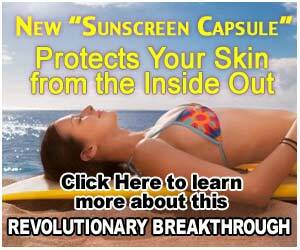 The majority of sun screens and sun blocks are made up of various chemicals – many are carcinogenic (cause cancer). It seems counterproductive to protect your skin from UVA and UVB rays to prevent skin cancer when the chemicals you are applying to your skin promote cancer. Of the 2 forms of radiation, uva and uvb, uva is the most damaging (UVB actually creates vitamin D in the skin). Sunscreens are rated via SPF – Sun Protection Factor. It is a value of the amount of time you can be exposed to the sun before you burn. As an example, if you burn in 10 minutes of exposure to direct sunlight, using an SPF 30 will allow you to be in the sun for a factor of 30 or 300 minutes (5 hours) before burning. How fast you burn is dependent upon your skin’s solar sensitivity, the time of year, and latitude north or south of the equator (how strong the sun’s rays are). Sunshine (during your respective summer) creates the best form of vitamin D (D3) and is a major health boost for your body. The use of sunscreen lotions and sunblock lotions prevent the creation of vitamin D so their use is questionable. A good 10 to 20 minutes sunbathing will produce more vitamin d3 than you need, at that point you can consider applying an organic sunscreen lotion to protect your skin from burning, skin damage and wrinkles. If your sunscreen contains any of these chemicals, don’t use it, they are dangerous and not an organic sunscreen. IF a sunblock or skin protection is required, then use a natural product, Sometimes all that is needed is a moisturizer and botanicals to nourish and protect the skin from premature aging. Antioxidants are important to preserving and repairing skin that has been overexposed to sun. Think about it, antioxidants protect fruits and vegetables from sunlight. Works the same on human skin. There are natural products that you can take as a pill and protect your skin from the inside out. No greasy, smelly lotions, no sand sticking to your lotion, no bees, flies or mosquitos attracted to your lotion… Quite a few benefits over sunscreen lotion. The main components are super antioxidants that repair cellular and DNA damage from radiation. CoQ10 and Resveratrol are also powerful cell protectors and rejuvenators. It is up to you to protect yourself. Even the cancer society is pushing these dangerous chemical sunscreens as protection against skin cancer and sun damage. If you are going to use a sunscreen, make it an organic sunscreen and avoid the nasty chemicals in most commercial lotions. A suntan lotion should be natural and body friendly!